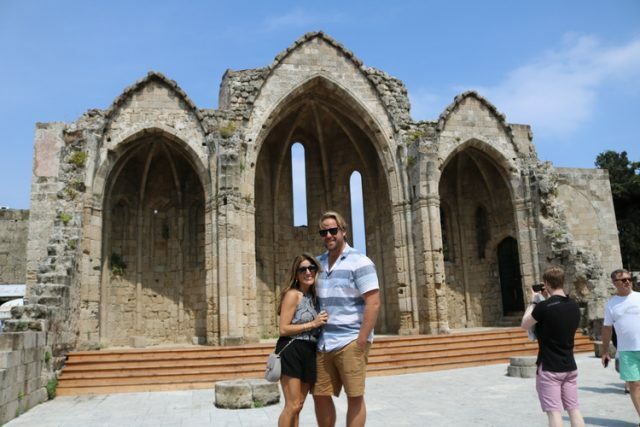 Visit Rhodes Old Town to experience influences from the Middle East, North Africa and Europe. To be fair, most people envision the Cyclades when they think of Greek island hopping — Mykonos, Santorini, Paros, etc. — where classic whitewashed buildings dot the islands. Rhodes Old Town, which has achieved UNESCO World Heritage status, is one of Europe’s most well-preserved medieval cities. It’s more like Malta in its feel and architecture than it is like the Cyclades, with its limestone buildings, cobblestone streets and tiny balconies overlooking the main thoroughfares. Rhodes Old Town feels like a product of its past parts, with influences from the Middle East, North Africa and Europe. Six thousand people still call the Old Town home, but the majority of those you’ll see wandering the ancient city streets are visitors, taking in the rich history and legends born on this island. 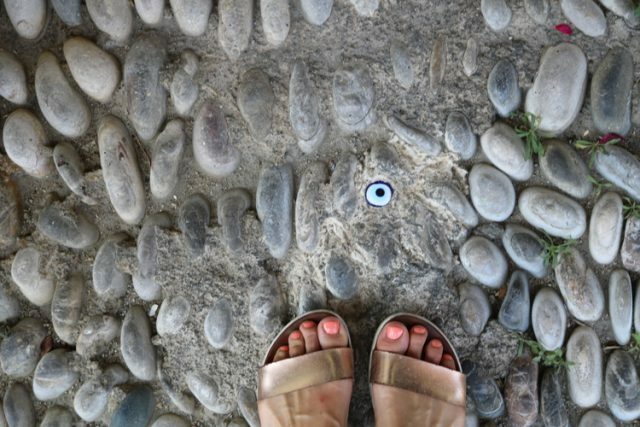 My husband and I have traveled a lot this year but we’ve not really had a wholly relaxing getaway until our trip to Greece, which absolutely nailed it for a mixture of R&R plus historic immersion. When we talk about sun-drenched, Rhodes certainly qualifies. With more than 300 days of sun each year, it’s almost guaranteed that you’ll get sunshine during your stay. We opted for a getaway in early May, which is traditionally out of ‘‘season’’ in Greece; most folks go in the heart of summer for guaranteed sunshine. Since Rhodes is so far south in the Aegean, temps were perfect and sunny (75-80 degrees) for nearly our entire stay, with the exception of one drizzly morning. There are seven gates to the Old Town with a few larger points of entry. Like many other preserved medieval towns, the Old Town is limited to pedestrians within the city walls. I keep referring to the Old Town, and there’s a reason for that. 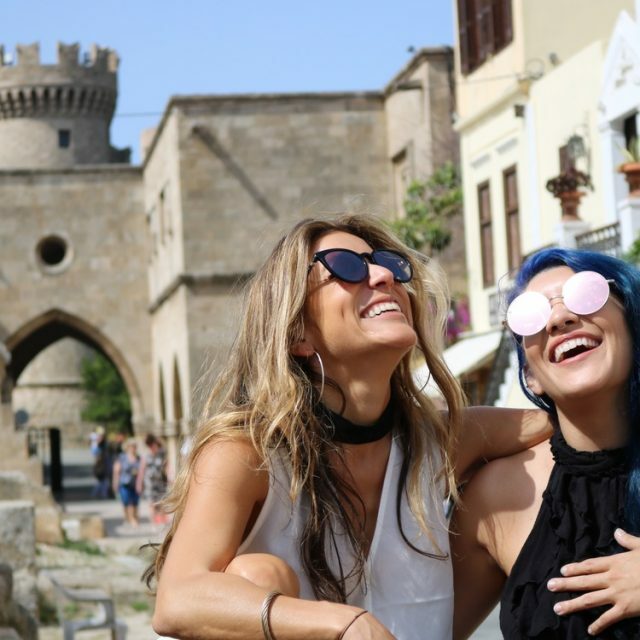 It’s easy to get a bit mixed up when planning your trip: Rhodes Town sits at the top of the island of Rhodes, and is a city within a larger island. 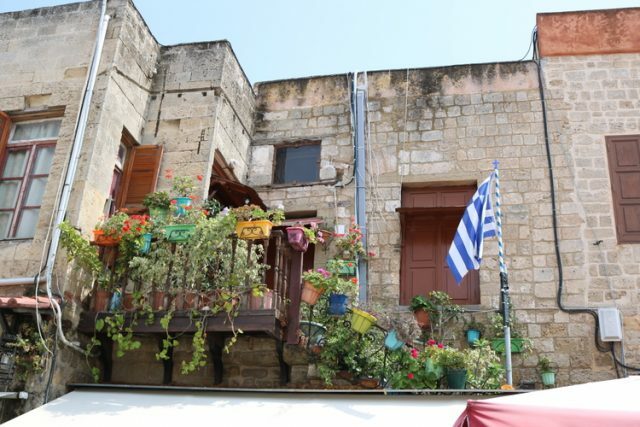 Rhodes Town has two parts: the Old Town and the New Town. 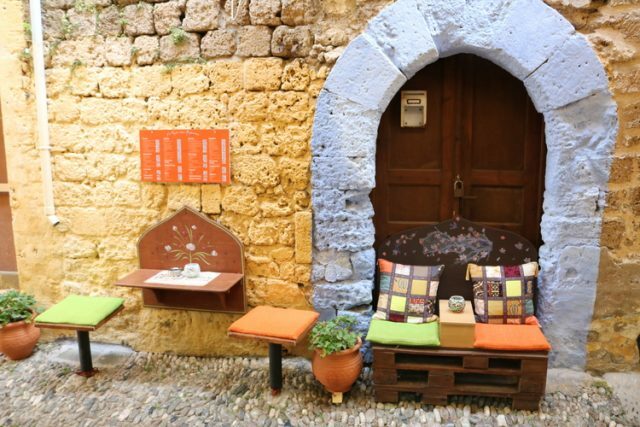 For most visitors (at least first-timers) who are going for the historic side of the city, the Old Town with its famous Street of the Knights will be your focus and where you’ll want to hang. 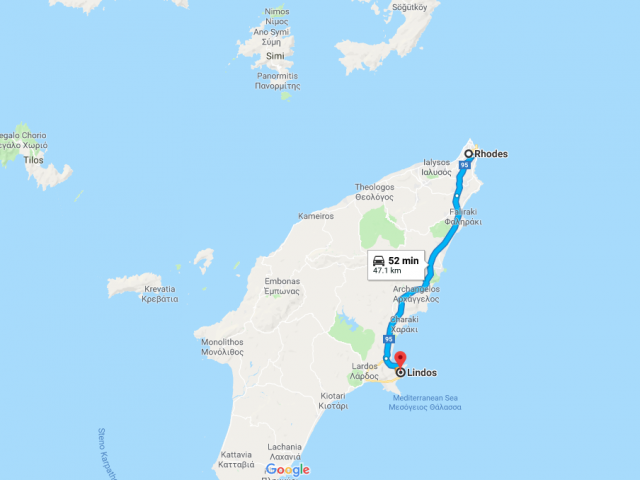 We visited Rhodes Town (at the top), Lindos (midway on the East Coast of Rhodes), plus nearby Symi. Evil eyes tucked into every corner. Street of the Knights, Old Town Rhodes. 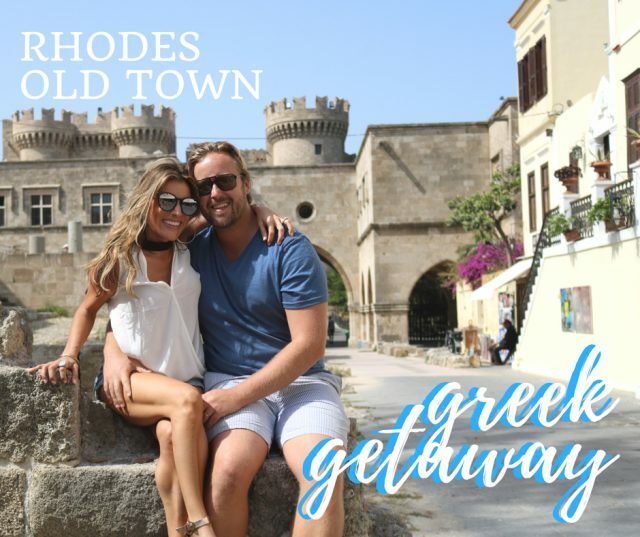 We chose Rhodes for a couple of reasons: First and foremost, Scott had nothing but glowing reviews of the island based on his memories from 20 years ago as a teen visiting with his parents. The fact that he wanted to return instead of seeing new islands solidified for us that it was a pretty special experience. Second, my Maltese heritage has some links to Rhodes, and my mom (born and raised in Malta) couldn’t help but be excited by the similarities between the two islands. The real connection between these two places stem from the Knights of the Order of St. John, now based in Malta but previously in Crete and in Rhodes, where they had a prominent influence. One of the most famous sights in Rhodes Old Town is the Palace of the Grand Masters, the castle-like structure that dominates photos of Rhodes. The palace sits off of the Street of the Knights, which once housed the Knights of the Order of St. John. 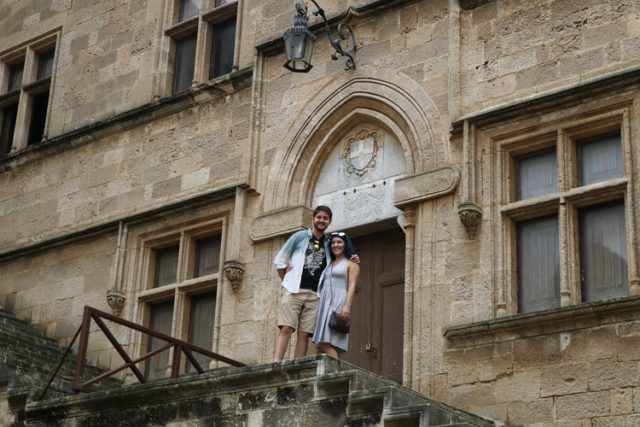 Dating back to the 14th century when they resided in Rhodes, the street was home to different “inns,” representing different nationalities of knights (the Inn of the Tongue of France is a stunner inside!). 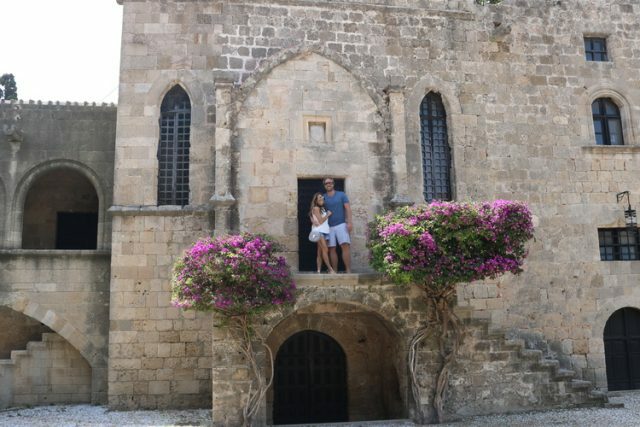 We opted for a tour of Rhodes with the excursion company Tourtlee on our second day to give us a historic primer and better understanding of the rich history of the island. Rhodian history is incredibly layered and includes the birth of philosophers, politicians and artists flocking to the island in its heyday. It also includes a strong mythological aspect with Helios being the patron god of the island (the Colossus of Rhodes was a statue in his honor). For our first day in Rhodes, we just wandered through town, and that’s the way I’d suggest approaching it. Getting a primer during your stay will help shed some light on the history that unfolded on this island over the course of 26 centuries, but there’s something beautiful about simply taking in the ancient facades and boutiques at your own pace. There’s a ton of shopping for those interested in taking home a piece of Greece, and while there’s certainly a number of touristy finds, there are also a number of great shops selling really unique jewelry and art. Stay tuned for part 2 where I'll describe our guided walking tour of Rhodes, which took us to the Palace of the Grand Masters and the Archaeological Museum, two sights that are absolute musts when you’re in Rhodes. For my family, Rhodes was a win despite the fact that it didn’t fit the traditional Greek postcard image. Old Town in particular brought major history, a gorgeous Mediterranean vibe, plus an incredibly affordable experience which made the experience even more enjoyable. For history lovers wanting a different side of Greece, Rhodes is worth putting on your short list.